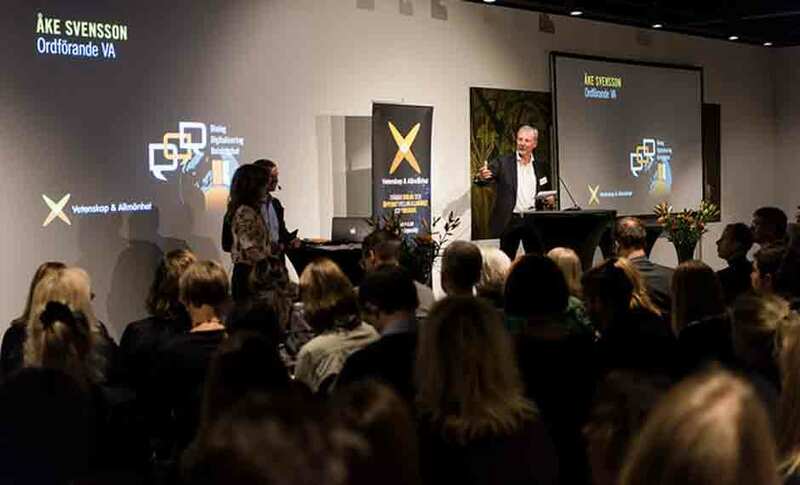 Open science, what it means in practice and how it can be embraced in Sweden was the theme of VA (Public & Science)’s annual conference held on 12 October in Stockholm. The conference attracted over 200 delegates interested in finding out more about open science and the opportunities that it offers. Åke Svensson, Chairperson of VA (Public & Science) at VA’s annual conference about Open Science 2016. Open science is now a strategic priority for the EU and a key pillar of the EC’s Open Innovation research policy. Celina Ramjoué, Head of Open Access to Scientific Publications and Data at the European Commission set the scene outlining the EC’s ambitions and what is happening at a European level, such as the Open Science Policy Platform and European Cloud Initiative. Society: giving citizens broader, faster, transparent and equal access to scientific information results in increased societal impact of science and research. What started as open access, making research results more widely accessible, the concept of open science has now moved to embrace other fundamental elements such as citizen engagement; evidence-based policy-making; science communication; alternative ways of measuring research outputs (altmetrics); incentives and rewards for open science practices; and e-infrastructure for open science. Celina acknowledged that Sweden already has many strengths in this area and encouraged Swedish stakeholders to stay engaged at a European level to get the benefits of international collaboration. The day offered plenty of opportunities for participants, many from VA’s member organisations and representing a diverse range of backgrounds including academia, business, education, policy making and the media, to reflect on how Sweden can further embrace open science. Roundtable discussions looked at opportunities and challenges relating to open access, open data, citizen science and responsible research and innovation. A panel discussion and online voting enabled participants to share further ideas and opinions. The day was concluded by Karin Röding, State Secretary to the Minister for Higher Education and Research, who emphasised the role of the research community in driving open science in Sweden with the support of the Swedish government. VA’s conference was filmed and can be watched online (in Swedish). Celina Ramjoué’s presentation in English is also available.